I wish I had something insightful to say today, but I’m a bit lost for words. It’s a good thing these pan-cakes speak for themselves. Yes. They’re pan-cakes and not pancakes. Semantics I know, but in my mind there’s a difference. Pancakes should be fluffy and airy, while pan-cakes should be dense, moist and have some bit to them, like what you typically see in a savoury pan-cake like a zucchini fritter for example. 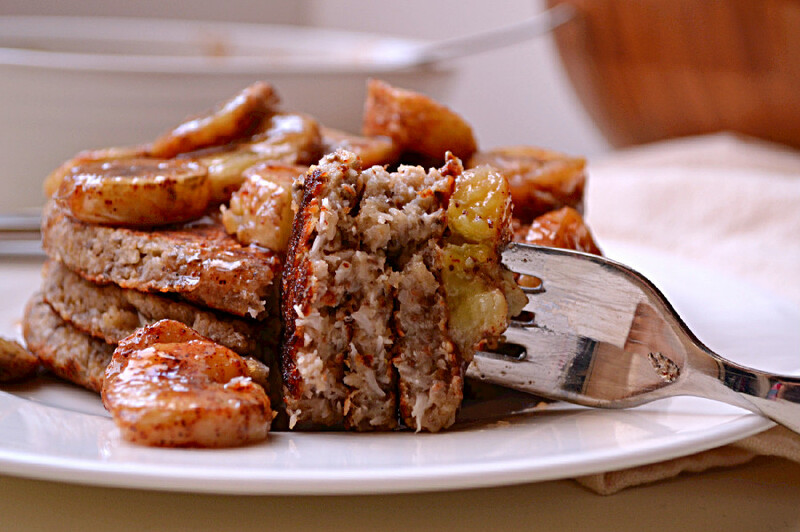 These pan-cakes are similar to that in texture but they’re not savoury in the least. They’re sweet decadent and indulgent and perfect for a weekend brunch when you’re craving something sweet but still want to keep it on the healthier side of things. They’re completely flourless, made with 100% whole food ingredients, are vegan, refined sugar free and gluten free if certified gluten free oats or buckwheat flakes are used. 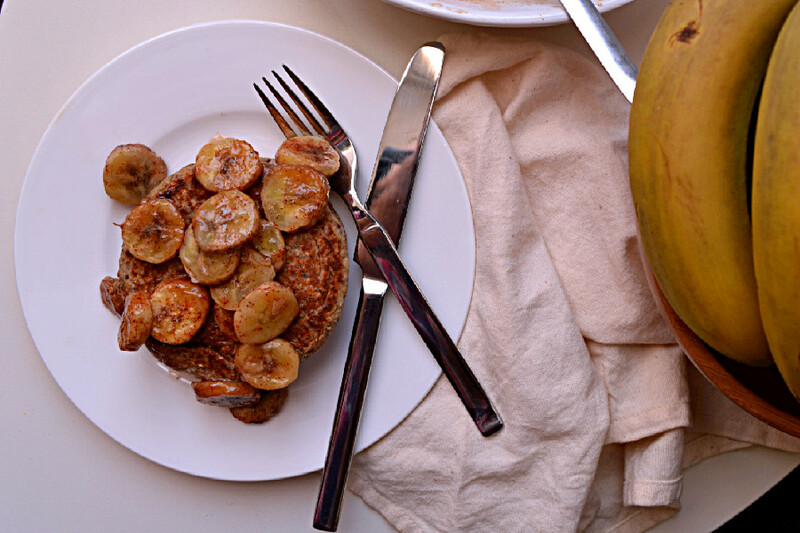 There’s a whole banana in the batter and they’re topped with a maple caramelized banana. As a result they’re really sweet, rich and indulgent and wouldn’t be my go to breakfast everyday, but they’re a nice treat every once in a while. These pan-cakes are hearty, well balanced and pack a nutritious punch from the whole food ingredients, namely the rolled oats and oat milk. Oats are a nutritious high protein grain, and an excellent source of fiber and B complex vitamins like folic acid, niacin, and pyridoxine, in addition to other vitamins and minerals such as manganese, iron, calcium and zinc . Oats contain 10-15% protein and 17% fiber. The fiber in oats, called beta-glucans have been shown to stabilize blood sugar, regulate blood cholesterol and boost immune system response. Luckily oats retain much of their nutritional value even when they are rolled and flattened to make rolled oats, which are rather quick to prepare into a porridge or simple to grind into a meal or flour for baking. Oatmeal made with rolled oats is a great breakfast food that is high in complex carbohydrates that provide your tissues and cells with the sustainable energy they need for the day ahead. A bowl of oatmeal also leaves you feeling satiated and helps fight food cravings until your next meal. On a last note, oats are gluten free by nature but can sometimes be contaminated since they are grown in close proximity to wheat fields or processed in the same facilities that process gluten so it’s best to look for certified gluten free oats if you are gluten intolerant or have Celiac disease. Grind rolled oats to a medium fine flour, combine in a bowl with shredded coconut, vanilla and baking powder. In a separate bowl, stand blender or immersion blender container, combine banana, chia seeds and 1/3 cup of oat milk and blend until well combined. Set aside to thicken and activate the chia seeds, about 10 minutes. Add banana chia mixture to dry ingredients, along with the extra 2 tablespoons of oat Milk and mix until well combined. Meanwhile, prepare the caramelized banana by slicing one firm banana into discs and placing in an oven safe ceramic or glass baking dish. Toss with maple syrup and cinnamon and bake in a preheated oven at 180 C until caramelized and maple syrup is bubbling, about 15 minutes, give or take a few, depending on oven power. Once the time has elapsed, turn off the oven and leave the bananas inside to keep them warm until the pancakes are ready. While bananas are caramalizing, make the pancakes. Place an oven safe dish or tray in the oven to warm it up. By now the pancake batter should be quite thick. Heat a pan over medium heat for a few minutes until it’s nice and hot, then reduce heat to minimum and wait about 1 minute. Brush with coconut oil, then, for 3 large pancakes, add 1/3 of the batter into the center of the pan and spread into a flat circular shape with the back of a spoon. Cook for about 5 minutes, or until you can easily slide a spatula underneath it and it feels stable. Use the spatula to shape the pancake into a smooth circle as it cooks. Then flip very carefully using a quick motion of the wrist and cook for an additional 5 minutes on the other side. You can divide the batter in 4 for 4 smaller pancakes. Remove plate or tray from the oven and tansfer the pancake on to it. Cover with aluminum foil or a clean towel to keep warm. It will seem very moist in the center, but will firm up as you make the rest. Repeat with the other 2/3 of the batter. 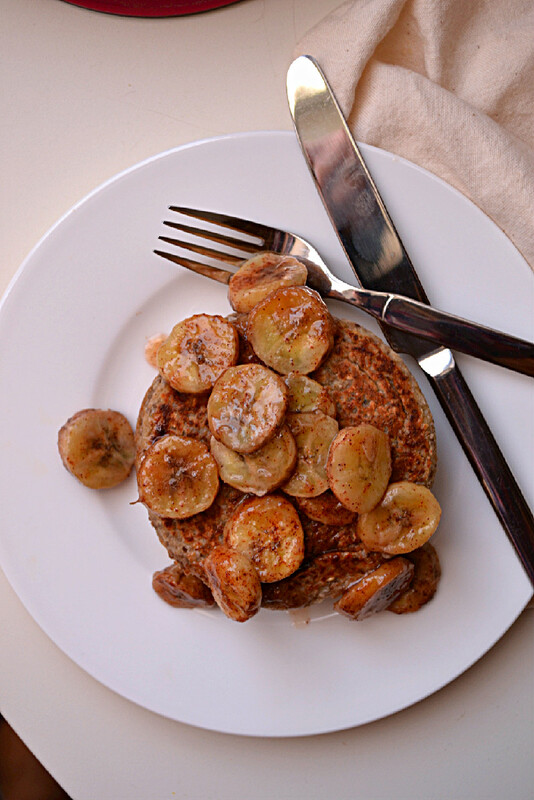 Once pancakes are ready, top with caramelized bananas and enjoy. You can top with as much or as little banana as you like. Any unused caramelized bananas can be stored in the refrigerator in an airtight container and warmed up on the stove top later. But oh they are very true Audrey and oh so decadent.